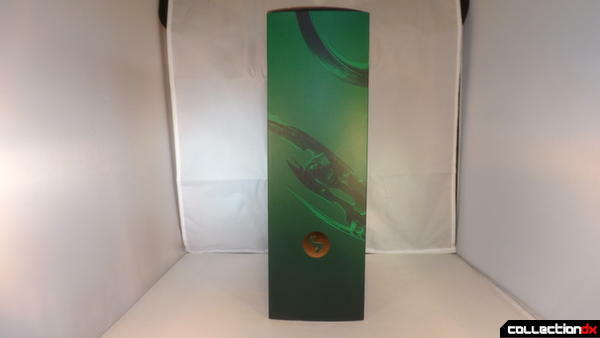 The usual design for the box here, character shot on the front, name on the top, info on the back and character logo on the side. 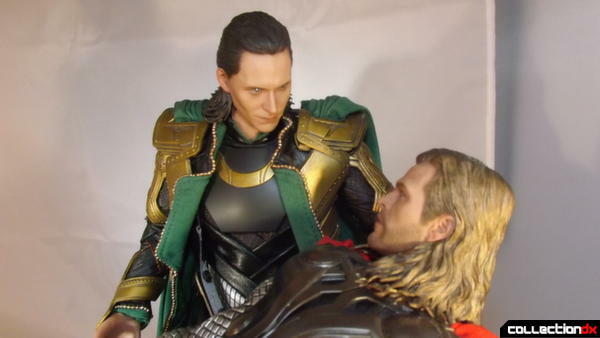 First a bit of a disclaimer, i'm one of those Loki fangirls. 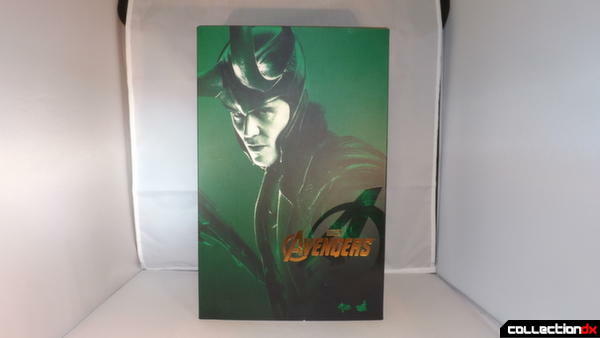 Expect gushing, fawning, drooling, and general Loki worship. I'm aware most of the members of this site are men, but i'm doing the review so you`ll all have to put up with me. 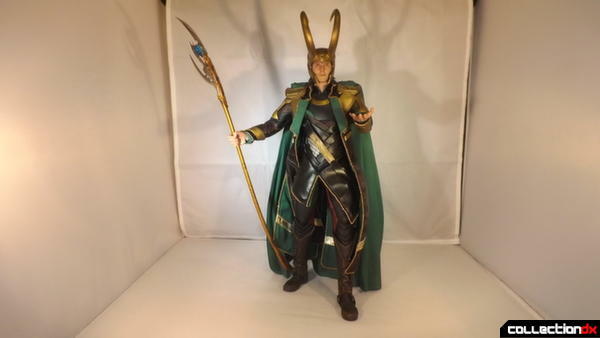 I was looking forward to this figure for a long time, not only because i'm a fangirl, i loved the sculpt and work on the outfit. 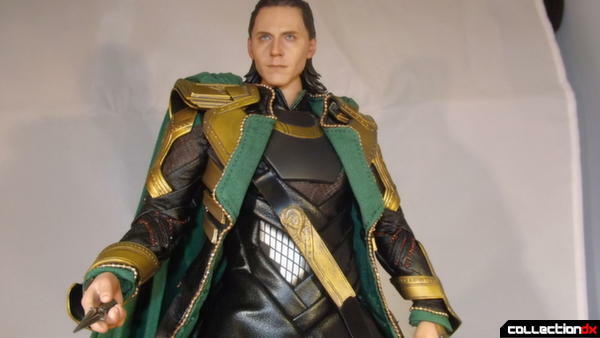 For me, this is the best looking Avengers figure. 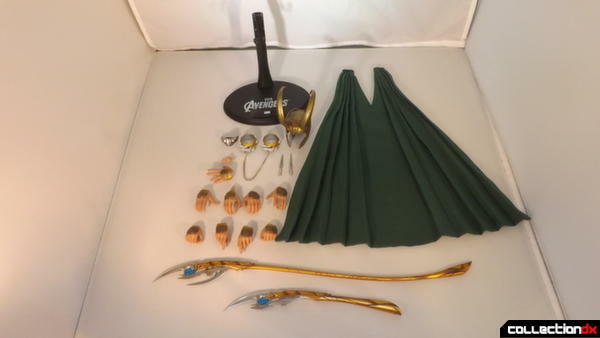 The outfit is masterfully tailored, a mix of leather, plastic and fabric. 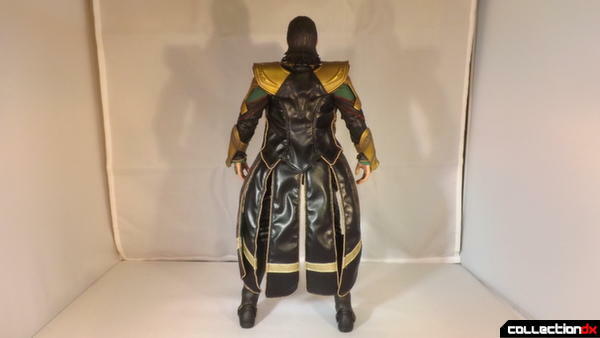 The cape like Thor's, is doubled layered with in-built pleats, unlike Thor this cape is removable by plastic clips that fit into the shoulder pads. 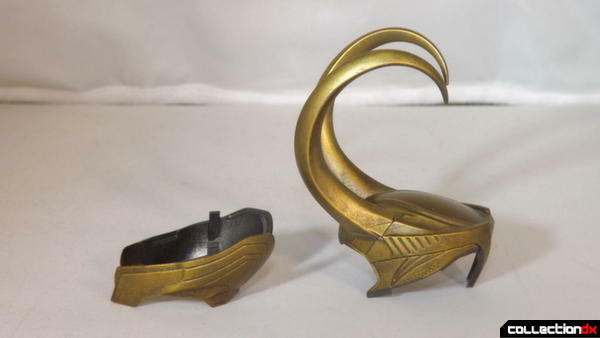 Loki`s helmet is made from plastic and comes in two parts (just like the real prop). 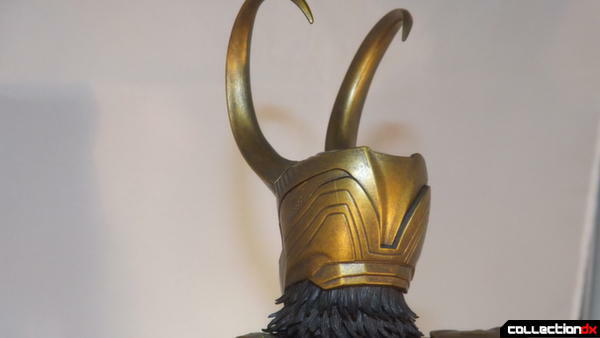 To fit onto Loki's head you first slide the lower piece around the back of the head, then you clip in the top section in by 2 clips on each side. 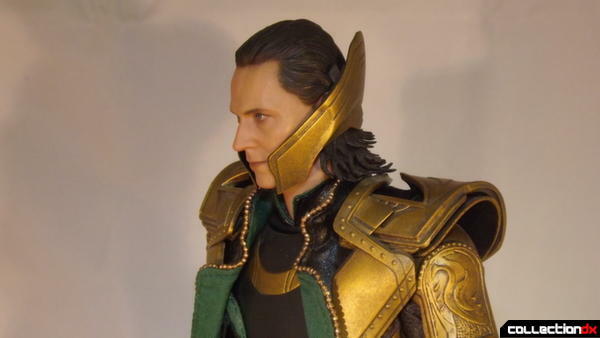 The head sculpt is wonderful, IT IS Tom Hiddleston. 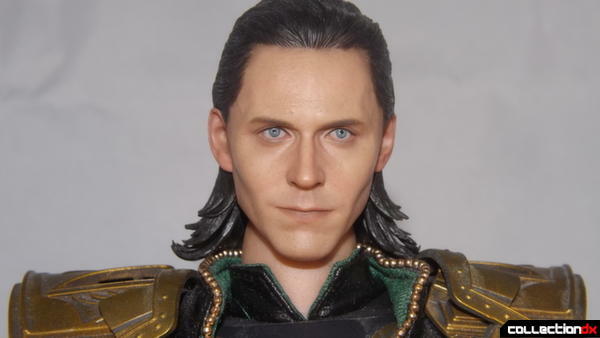 The eyes, the cheeks, the slight smirk in the mouth. 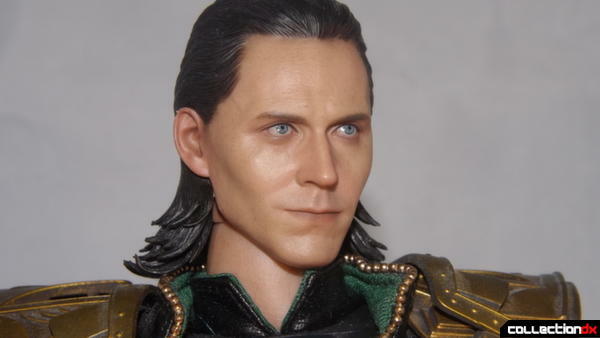 Loki's hair is layered rubber which has some give when you need to pose it. 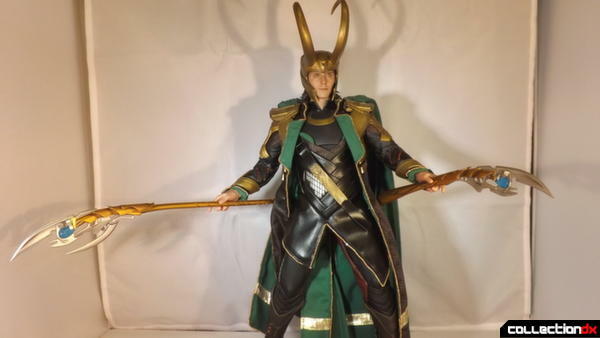 Loki comes with a bunch of accessories, the usual Hot Toys stand, his green cape, the helmet, 4 sets of hands (plus 1 left hand), Asgardian handcuffs and muzzle, two daggers, and the full sized and small versions of his Tesseract powered spear. 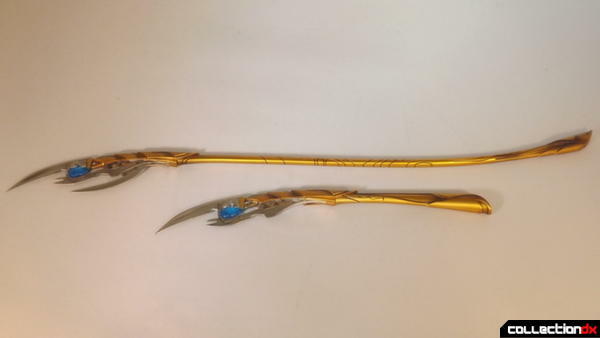 The Spear's are wonderfully detailed, each have markings down the grip, they both have gold paint with black shading. 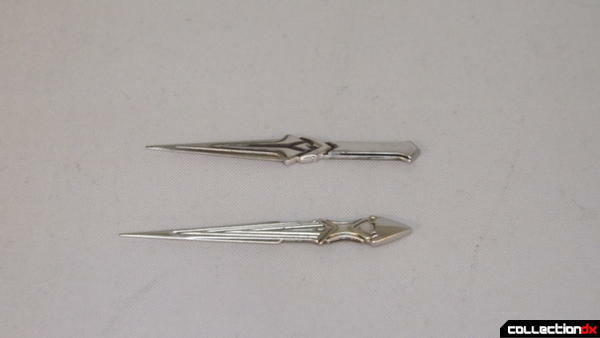 The Spear tips are slightly different, the larger spear has and extra spike on the bottom. 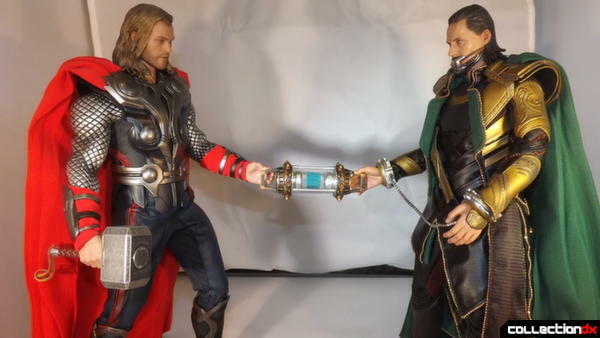 They both have clear blue plastic Tesseract crystals. 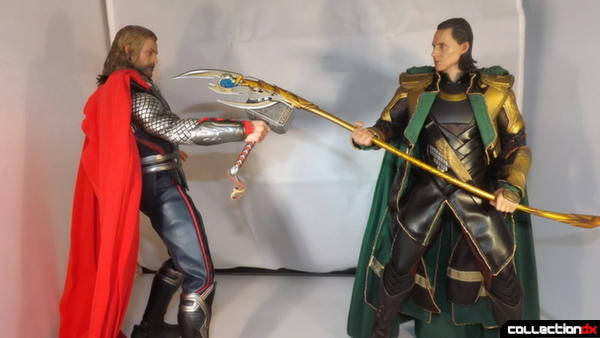 Loki can hold either spear in his left or right hand. 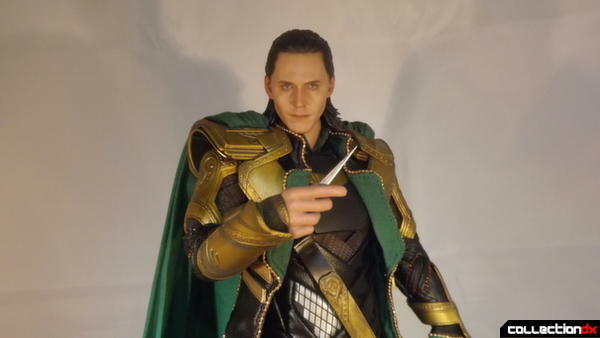 The dagger`s do fit into Loki's hand, but they're not really secure. 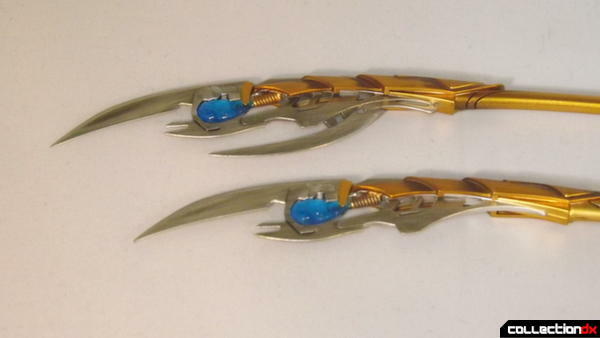 They'll fall out if the figure is moved or knocked. 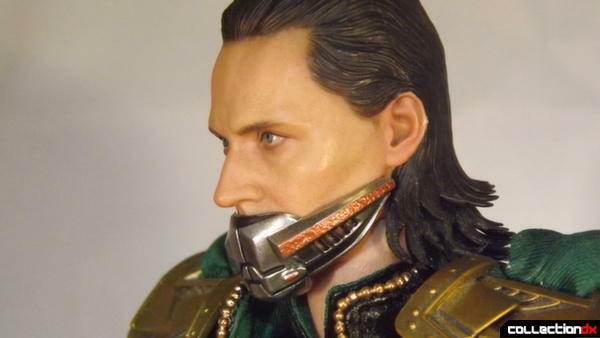 The Asgardian handcuffs and muzzle help you re-create Loki and Thor`s final scene in the Avengers film. 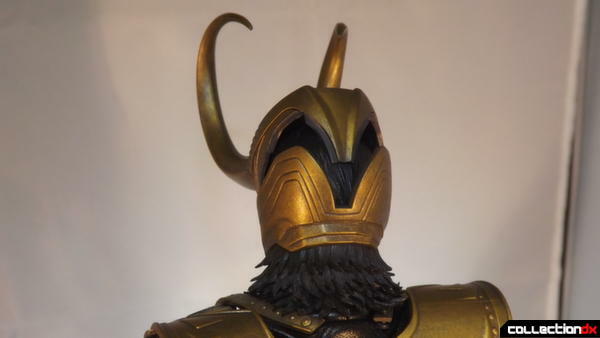 To attach the muzzle you simply place it over the mouth of the figure and it holds in place via friction, I wouldn't advise using the muzzle on any other figure as it's molded to Loki`s face. 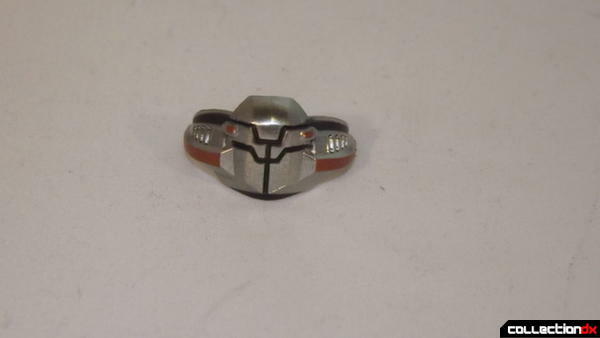 To attach the handcuffs slip them over the wrists before attaching the hands. 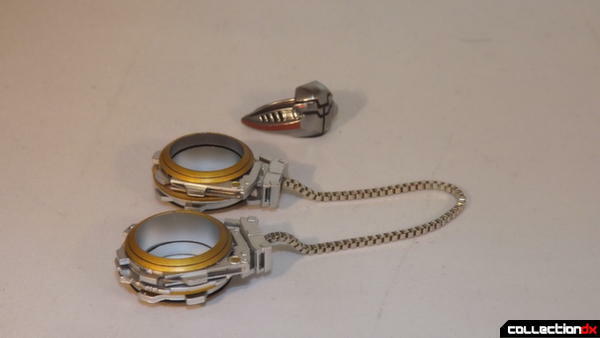 The handcuff chain is made of linked metal. 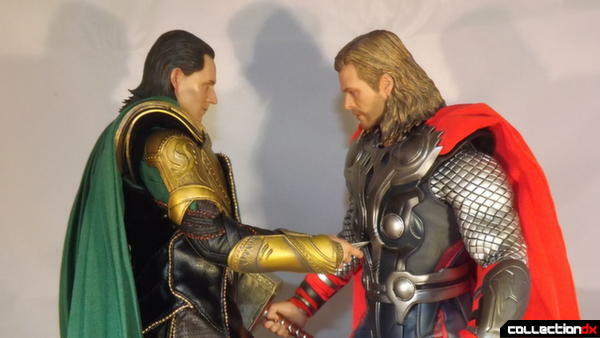 If you have the Thor figure you can finish off that final scene re-creation. 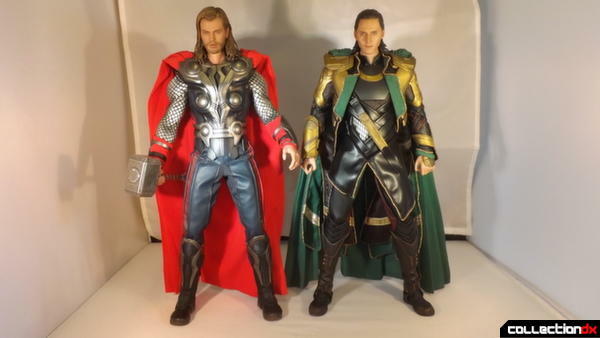 Loki and Thor are in great scale together, the look of this Loki figure is pretty much the same as his appearance in The Dark World. 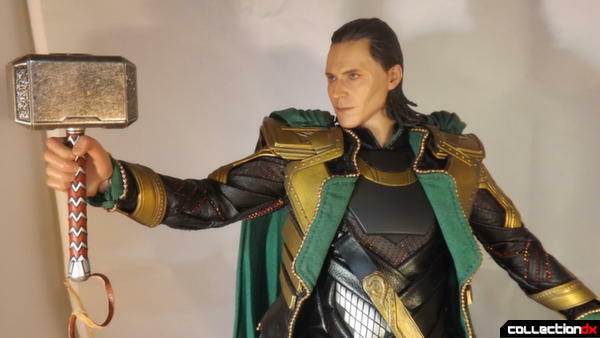 For anyone asking, yes the Loki figure can hold Mjölnir, unlike his real counter-part. 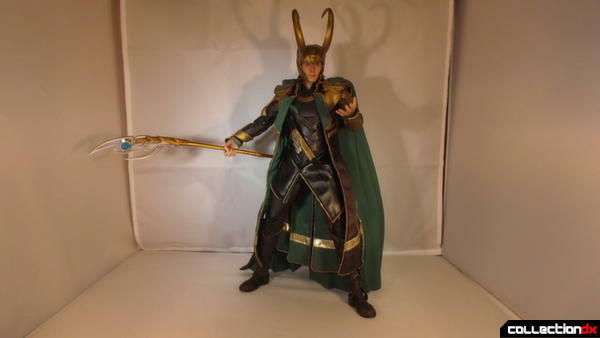 I love this figure, it was worth every penny. 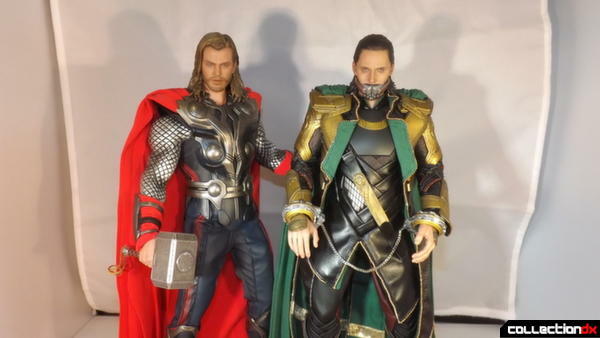 As with all the Avengers figures, it does have a mean asking price now. 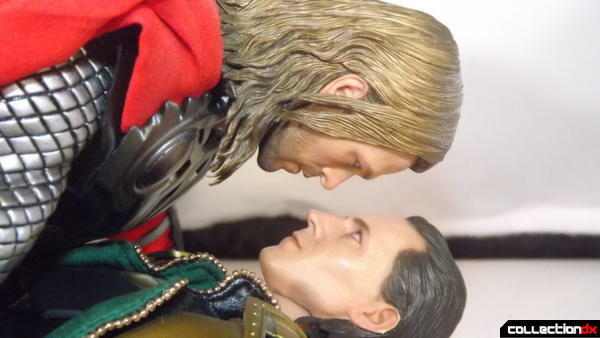 It's my favorite Hot Toys figure not only in my collection, but in the figures that Hot Toys have ever made. Now some pictures to fulfill my weird fantasies and make all you boys uncomfortable. 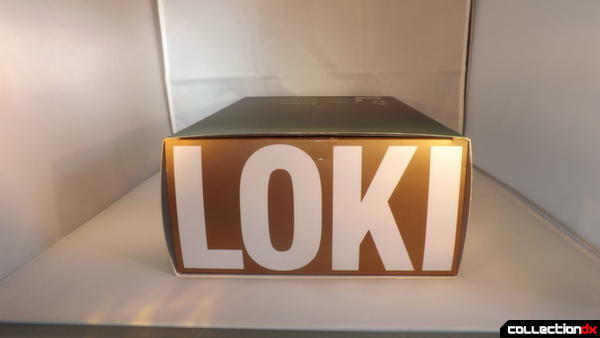 We're up all night to get Loki! 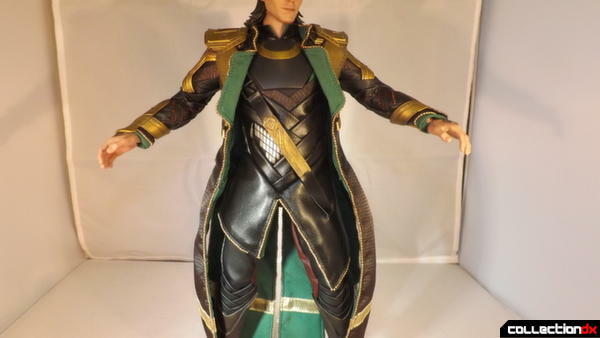 My brother picked this one up in China and this is one Hot Toys fig that I've been eager to check out.... is it no wonder that the character is arguably more popular with fans than Thor himself?